To pay attention to your customer, make a deliberate effort to improve. Follow the surfer advice, pick one thing to improve on each and every time you work on your SNAPs. SNAP mastery does not come when we first use SNAP. It takes time and practice. Listen to your customers, work on one thing at a time and seek improvement. Take the journey to full, level five mastery one step at a time. What does this mean to us? It means that every one of us, at all levels in the organization, have the burden and responsibility of supporting our brand and delivering exceptional service. Each and every time. Today. Do this by mastering SNAP. Mastery, Level One — Draft Three SNAP Messages. When you first use SNAP you will focus on simple messages. Know that simple messages are the core of SNAP. This first level of mastery is centered on those simple messages. To graduate level one, draft three SNAP messages that fit into one or more of your key and routine work flows. Your goal is to have three usable messages that can be used routinely within one of your key work flows. This level is the simplest and easiest level in terms of technical skill — yet is the most difficult because it is the first step on your change journey. Yes, embracing and using SNAP will require a change journey. Level One is your call to begin the journey. Here and now. Not later. The call is now. Mastery, Level Two — Use Three SNAP Messages Routinely. This second level is focused on the use of your first three messages. Your messages should be usable on a daily basis (or, at a minimum three times a week). If your messages are not routine enough for that level of usage, then go back to level one and develop messages that are part of a key and routine work flow. Use these messages for a minimum of three weeks. Your goal here is to get a few simple SNAP messages into your daily practice, to develop a habit around SNAP usage. Developing this habit and a SNAP way of thinking is critical to long-term success. At this level, you will begin to engage in daily disciplines that will set the foundation for long-term success with your customers. Mastery, Level Three — Learn to Improve. At this level, you will master improvement. After getting past your first three weeks of usage, look closely and listen carefully to your messages and your customer’s responses to them. Improve each message. Yes, that is correct, improve each of your three SNAP messages, and layer in additional messages. Target a minimum of three additional messages. Or, push yourself, and layer in five or more. Spend another three weeks at this level. During the three weeks improve each of your messages, your original three and the new ones you are layering in. The goal here is to reinforce the habit and pattern of SNAP usage, and, more importantly, to add in the habit of improving your messages and using new ones. An effective way to work through this level is to build a library of SNAP messages and message templates that can be customized. Focus on getting yourself prepped for level four. At this level, you will also begin to think very differently about how you draft and complete your SNAP statements. Focus on being simple and concise. Mastery, Level Four — Reach for the Extended Dimension. At this level, you are routinely using SNAP messages, you are improving ones that you generate, and you now are layering in ideas covered in SNAP’ED, Extended Dimension. You have a sufficient number of messages in your library, and have developed the ability to quickly put together and customize messages, and are now focusing on linking messages, including closing questions and closing statements. You are also looking more closely at your work flows to ensure SNAP messages are being used at the most strategic and opportune times. You continue to use the skills mastered during the previous levels. At this level, you are now focused on value. SNAP messages are not about marking items off your check list. If you are marking SNAPs off a list as you deliver them — such as, “Yup, tossed out SNAP number five just now. Five is good. My manager will love me. Five SNAPs in one day!” — then you are missing the core, fundamental reason for doing SNAPs in the first place. At this level, you must be well past the routines of lower levels, where those routines were used to build discipline based on repetition. Focus on value. Review your library of SNAP messages and make sure they are truly focused on value — that which your customer values. Mastery, Level Five — Teach SNAP to Others. At this fifth level, you routinely: use SNAP messages; develop messages real time; access a library of simple and extended messages; customize simple messages to meet unique circumstances or individual customer circumstances; use closing questions to get customer feedback; use closing statements to reinforce expectations; and, improve messages as you use them. Your messages are focused on value and outcomes. And, to be a full level five SNAP master, you teach others to master SNAP, coaching and assisting three others to reach level four. Begin small, keep it simple. Know that the power of SNAP comes from the consistent use of simple SNAP messages. The advanced levels of SNAP mastery are all based on leveraging these simple, core messages. Accept the challenge and become a SNAP MASTER! Mastery, Level One — Draft and use three SNAP messages. Mastery, Level Two — Use your three SNAP messages daily for three weeks. Mastery, Level Three — Improve each of your three messages and add three or more new messages. Do this over a three week period. Use this time to build up your library. Focus on discipline over routine. Mastery, Level Four — Put the Extended Dimension into your messages. Improve your messages to focus on outcomes and adding value. Mastery, Level Five — Teach SNAP to others. Coach and assist three others to reach level four. SNAP can be trained in a workshop setting or one on one. Information in the next few sections give ideas about training SNAP. © 2012, Philip Espinosa. All rights reserved. As a strategic human resources leader, Philip Espinosa partners with people to deliver value: People | Partnerships | Value serves as his tag line. He believes that service starts with the customer. 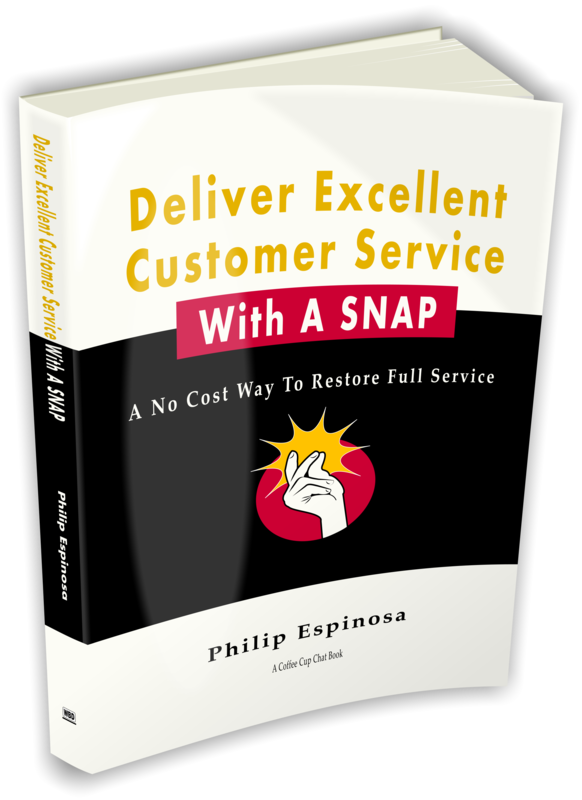 His book "Deliver Excellent Customer Service with a SNAP” helps others drive customer engagement using simple and consistent communication strategies. A second book titled "Focus On Your Success - 24 Simple Insights To Drive Daily Achievement" (ebook) helps working professionals view their daily choices through a different perspective. In addition to his writing, Philip works with strategic human capital initiatives and has delivered successful results over a career spanning more than 25 years. Subscribe with your email and stay up to date with SNAP!